Here's a delightful Radko ornament to commemorate the arrival of a new little guy or gal. 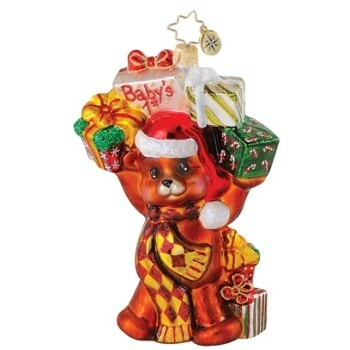 The bouncin' baby bear Radko ornament is cute, cuddly and loaded with colorful gifts. Crafted in Poland from high-grade blown glass, this is one of the baby ornaments by Christopher Radko personalized with the child's name and the year too. We'll hand letter it in gold paint for a bright, lasting celebration of the birth or adoption. Give new parents or grandparents a keepsake-quality ornament this year - the bouncin' baby personalized glass bear that can be shipped in a fantastic Radko gift box at your option.